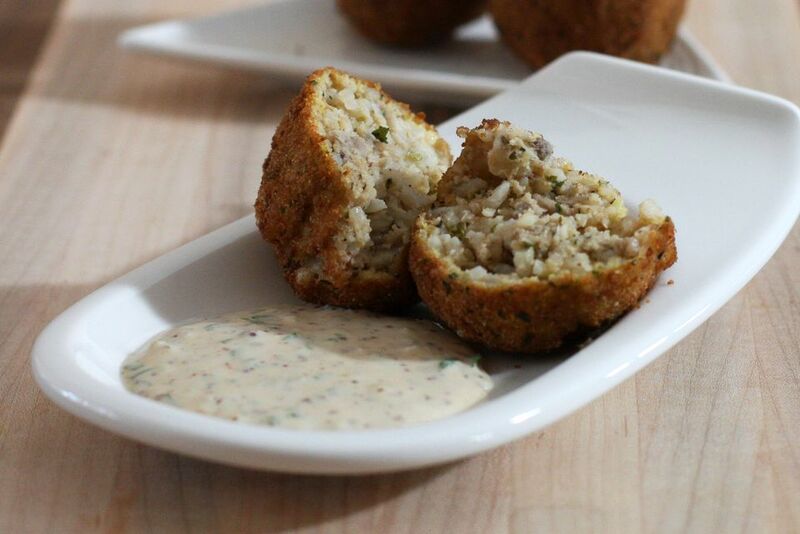 These seasoned boudin balls are made with leftover turkey and rice. Like many Cajun dishes, the recipe looks long because there are a lot of ingredients. It's really a one-step process of simmering everything together in a pot, then forming the mixture into balls and frying them. I freeze some of these to have as hors d'oeuvres for the Christmas holidays. Cool after frying and put into a freezer container or bag. Place the turkey, water, onion, celery, bell pepper, garlic, 2 teaspoons of the salt, 1 teaspoon of the black pepper, and the cayenne in a medium saucepan. Bring to a boil, reduce the heat, and gently boil, uncovered, for 45 minutes. Drain, reserving the liquid. Place the meat and cooked vegetables, fresh parsley, and green onions in a food processor and pulse about 20 times until well mixed but not pureed. Transfer to a large bowl. Add rice to the mixture and gently stir to combine, adding the reserved broth 1 tablespoon at a time, until the mixture can be formed into balls and will hold its shape. Taste, and add more seasoning if necessary. Using about 2 tablespoons turkey mixture for each one, shape into balls. These may also be formed into mini balls the size of large marbles to have as hors d'oeuvres. Use about 2 teaspoons turkey mixture for each mini ball. The frying time will be 1 to 2 minutes for these smaller balls. Place flour, eggs, and bread crumbs mixed with the remaining salt and pepper in three separate dishes. Roll the balls in the flour, then the beaten egg, and then in the breadcrumbs. Heat the oil to 375 F in a large saucepan. When the oil is hot add the balls, 5 or 6 at a time, adjusting the heat up or down as necessary to maintain a temperature of about 375 F.
Transfer the balls to paper towels as you remove them from the oil; they will take 2 to 3 minutes to fry.